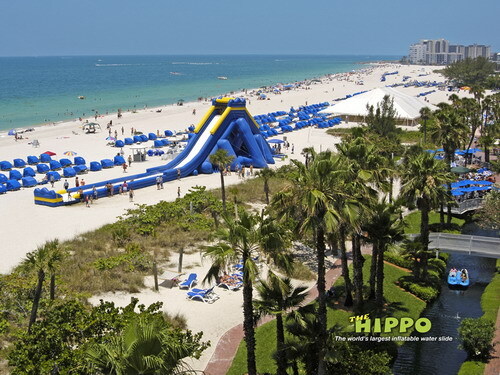 In case you're curious, the image above is the Hippo inflatable water slide that developer Joe Sitt says he's going to put up somewhere on the Coney Island property that he made vacant this winter and that is currently surrounded by plywood fences. You can check out the slide here on the manufacturer's website. If you've demolished anything and want one of your own for your empty property, you should know they take American Express. The big water slide is 36 feet tall, 47 feet wide and 168 feet long. The top platform is three stories high and it's a 40 degree drop. The manufacturer estimates gross revenue of about $29,000 a week. Most operators charge $2-$4 for a single ride, about $10-$15 for an hourly pass or $20-$30 for a full day pass. It takes about 6 hours to set up and comes with three days of training. One of the slogans on the website is, "When it comes to attracting thousands of families to your location, size does matter." Coney Island Mega-Focus #3: Circus Coming to Town?